pCloud Drive is an excellent solution for those moments when we run out of free disk space. It works just like a cloud synchronization utility, such as Dropbox or Google Drive, but it doesn't keep the bulk of your data on the local drive and it is much easier to access. To put it in plain terms, you can think of pCloud Drive as an extra disk drive for your Mac, on which you can store your surplus data. You can get up to one TB of extra storage space, depending on what kind of subscription you want to go for. Alternatively, you can opt for the free plan, which gets you 10 GB of free space and you can earn up to another 10 GB by inviting friends, liking, sharing and so on. As previously mentioned, pCloud Drive works like a cloud synchronization utility, but instead of creating a share folder, in your Favorites section, it will create a virtual drive, next to your real ones. You can access and use this virtual drive like any other disk partition. This includes creating folders and sub-folders and moving data around without any limitations. The files you store on the virtual drive will be uploaded automatically to the cloud, in the same folders structure. The uploaded files can be accessed from anywhere in the world, on a web-based user interface, with a browser of your choice. Any changes you make locally or on the cloud will be made automatically on the other part. Besides browsing through your data, you can also invite people to access your files or generate download links and send them to your contacts. It is also possible to set the application to synchronize a local folder with a folder on the cloud. This is particularly useful for keeping backups of important files. Since the recent release of version 3.0, pCloud Drive comes with encryption capabilities as well. You can specify a pass phrase in the general settings menu and click a button to create an encryption folder on the virtual drive. Anything you store in that folder will be encrypted automatically and kept safe at all times. The application provides up to 10 GB of free storage space. It enables you to upload data to the cloud, just by storing it on a virtual drive. Also, pCloud Drive comes with a new and powerful encryption feature. Instead of spending a large sum of money on a new hard drive, you can spend far less on pCloud Drive for the same results. 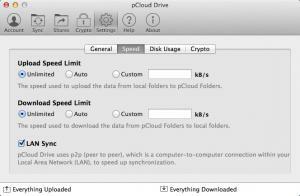 You can download pCloud Drive free here.